Little people love macaroni and cheese. My son grew up on boxes of Annie’s shells and cheese. Some fortunate parents are able to sneak vegetables into the mix, such as peas or broccoli. Not us. He would not touch it if there was anything green inside. Thankfully he loved fruit and there was always little side dishes of strawberries, apples, grapes or oranges. Even adults needs this kind of food at times. The soft texture and mild cheesy flavor of macaroni and cheese remind us of our childhood meals, when we felt safe and cared for, bringing comfort to our soul. I used mezzi rigatoni. This would have been wonderful with added english peas. The peas would have fit perfectly in the wide open holes of the rigatoni. But we couldn’t have anything green inside now could we? Bring a large pot of salted water to a boil over high heat. Add the pasta and cook until al dente. Drain well. Position a rack in the center of the oven and preheat the oven to 350°F. Butter a deep 4-quart casserole. Melt the butter in a medium saucepan over medium heat. Whisk in the flour. Gradually whisk in the milk. Bring to a simmer, stirring constantly, until the sauce thickens. Reduce the heat to low and simmer for 5 minutes. Remove from the heat and stir in 1 cup of the cheddar and 1 cup of the american cheese. Season to taste with salt and pepper. Spread one third of the pasta over the bottom of the casserole dish. Top with half of the shredded cheeses and a third of the sauce. Repeat, using another third of the pasta with the remaining cheese and half of the sauce. Finish with the remaining pasta and sauce. Sprinkle parmesan cheese over the top. Bake until bubbly and golden brown around the edges, about 30 minutes. Oh yum…I would take a dish of that right this very minute! 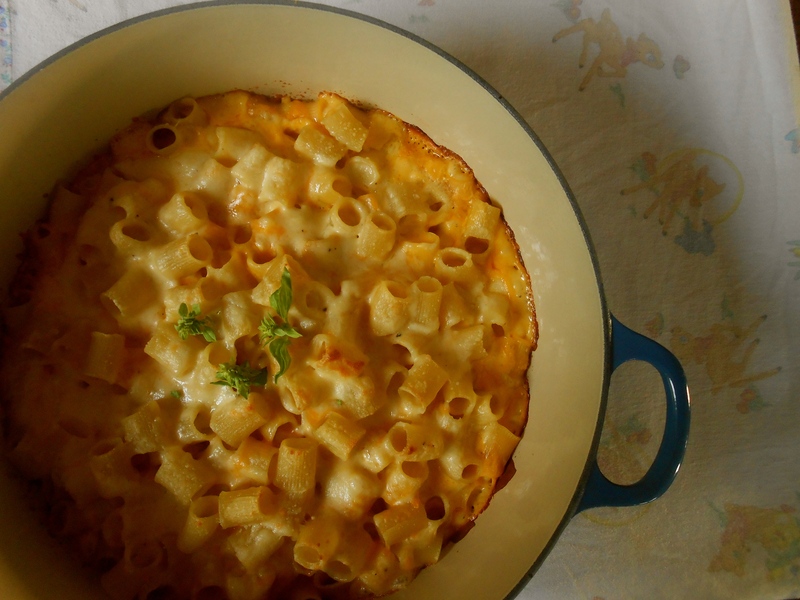 It looks so creamy, and cheesy, and perfect… now I’m craving mac and cheese! I’ve been sitting here wondering what to make for dinner… I think you’ve made up my mind, Seana! Little people aren’t the only ones in love with mac and cheese. I love this dish, but rarely have it. I can go for a scoop right now (it’s 7:30am). I love the size of those noodles! One of my favorite comfort foods. You never get too old for this dish. Love the way the noodles look that you used here, I know some little people and big that would really like this, I bet this is a perfect use for the American cheese. Ooey gooey deliciousness. 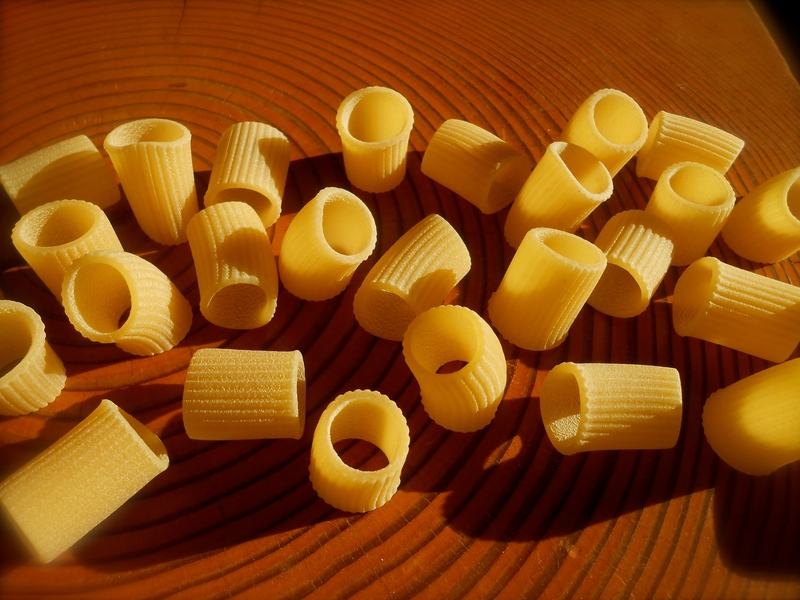 I love the blend of cheeses and this pasta shape – so comforting for little and big people alike. I have been eating cheese like it’s my job recently. Chefie indulged me with some grilled halloumi last night, but I think mac and cheese is on the docket for tomorrow when the weather’s supposed to turn a bit cooler again. With no small ones to please just yet, I typically do add something green (typically peas) to try and bring some nutritional redemption to an otherwise indulgent dish! Thank you thank you thank you so much Cottage for this recipe! I am bookmarking it and making it soon! Oh good Sonal! Please report back with your opinion if you do…would love to hear it. Yummy! This looks delish! My youngest daughter absolutely loves mac and cheese. This looks like a great recipe to try on her. Thank you.. :) Hope you get a chance to make it. It’s very easy to prepare and goes together swiftly. Nice of you to leave me a comment today! I’ve been meaning to make some mac and cheese for so many weeks. Your version looks so lovely and delicious. I really love the photos and recipes in your blog. They are so awesome. I wish you a fabulous week! Liz…you are so kind, thank you for the nice comment. You have such a lovely blog and I always know where to go when looking for something to bake. Thank you! So glad to see someone else (that I have mad respect for) using the american (ooey gooey) cheese in their mac and cheese. I always do and sometimes even velvetta mixed with other cheeses it gives a creamy cheesy velvety sauce. Love this!! I make parmigiano breadcrumbs and sprinkle on the top. Love how everyone seems to love mac and cheese and have their own spin on it! I can’t resist adding blue or melting Italian cheese. Love the way you describe how peas would snuggle up inside the tubes of the pasta. When I was a kid i would always eat mac n cheese with peas so I know exactly what that is like! Blue cheese would be fabulous! I appreciate peas in mac and cheese and I almost cooked some just to put in my serving. :) Such a wonderfully comforting dinner. That is a damn fine looking Mac n cheese my friend. I’m getting hungry already… The curse of an early rising food blogger! This looks utterly decadent. Mac&Cheese is one of those dishes that is at its best when made from scratch. I’d love to try this with some soft French cheese! Oooo, soft french cheese is decadent! How wonderful would that be! Indeed Patty! I don’t miss the green in here at all! Thank you for stopping in! I don’t know why I never make macaroni and cheese. It’s obviously some sort of mental illness that needs to be remedied. Funny you should mention eating the whole pan because my son did that very thing. I only had a medium size scoop out of it and it was completely gone in two days! True comfort food for a cold night! I’ll be making this for sure, very soon! :) Certainly is true comfort. My true comfort comes from a bowl of carbonara…but there is something about these yellow cheeses that grab you and give you a hug. That mac and cheese looks fabulous! Beautiful shot to capture it, too! I’m a big kid and I LOVE mac n cheese! Thanks for sharing this recipe. It’s hard to make in Switzerland. American cheese is something I can’t find here. Cheddar I can though! Ha! Now why oh why are you unable to find American cheese in Switzerland! :) Can you imagine? Well, I’m sure you can throw together a wonderful mac and cheese without it. Yes, you may have a big bowl of it…but you’ll have to make it Dimple. :) Seriously, I wish I could stop by right now and bring a bowl of this to you. Wouldn’t that be fun? Yes that would be. Maybe one day all of us blogger friends can arrange a massive food party in reality…Bring food…meet, eat and be merry x I will definitely be making your mac and cheese recipe! I stood at the cheese section at the market far too long deciding which cheese to buy…velveeta or American? They only had velveeta in individually plastic wrapped slices and American was stacked…that was the tie breaker! I really love your mac and cheese memories. And I am sure THE DAY THE EARTH STOOD STILL had been released many years before you watched it at 8 years old. :) Kraft Deluxe and Star Trek is a perfect combination…I bet you loved those picnics on Friday nights. Thank you for your lovely comment Ken. Ha! Great story. Sounds fabulous with lardons! And love the copper pan presentation too. Saludos y un buen trabajo en tu blog. :) That is so impressive. I would never think an Italian cook would use American cheese! Very open minded I would say. My son is EXACTLY the same. Loves mac and cheese, won’t touch it if I put veggies in it. Sigh! Ha! Those silly boys…they don’t know what they are missing. Oh well, I love mac and cheese without anything green too. Isn’t there a sense of satisfaction when they do eat vegetables though? Thank you for your visit, nice to see you here this morning. I love Mac and Cheese! although they make me feel ultra guilty, the weekend is to enjoy and the perfect excuse to cook them! Awww shoot. I don’t like to feel food guilt, not fun. I’m was glad my son has a rather large appetite, after my little scoop for dinner I didn’t have a chance to have anymore! He finished the whole pot by lunch the next day. Yum! I was JUST thinking I needed some more mac’n’cheese in my life, now I see this, I shouldn’t wait any longer. Oh my gosh. I just ate lunch and I’m hungry again looking at this. I’ve never used mezzi rigatoni in mac & cheese before and now that I’m seeing it I have no idea why. It sounds like the perfect toothsome pasta for a baked casserole — yum! You are currently reading mac and cheese at COTTAGE GROVE HOUSE.